Five people were pronounced dead at the scene, and a sixth died after being taken to the hospital, ABC News reported. Authorities have now labeled the mission a recovery effort. 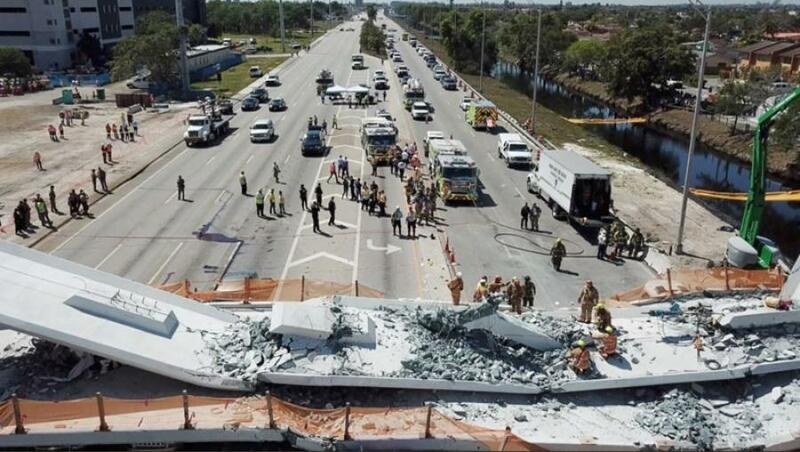 Six people have died from the bridge collapse at Florida International University on March 15. In addition, 10 people who were injured were taken to Kendall Medical, and categorized as level-one trauma patients. Another eight also were admitted and treated for less serious injuries, including broken bones, bruises and abrasions. Others may have been taken to different area medical facilities, ABC News reported. The bridge was built using accelerated bridge construction (ABC), a method designed to safely and quickly erect bridges without lengthy road closures and traffic delays. In the past, both Rhode Island and Massachusetts used this technique to build bridges without any incident. Geosynthetic Reinforced Soil-Integrated Bridge System (GRS-IBS), where closely spaced geosynthetic reinforcement and granular soils are combined to make a new material that is often used to build abutments and approach embankments. Prefabricated Bridge Elements and Systems (PBES), which are structural portions of a bridge that are created offsite. Slide-In Bridge Construction (SIBC), which uses PBES to quickly build or replace a bridge. The new bridge is built on temporary supports parallel to the old bridge. Then, the road is closed, the old bridge is demolished or slid away as the new bridge is slid into place. It is then tied in to the approaches and paved. This process is usually complete between 48 and 72 hours. In this instance, the pedestrian bridge was built on temporary shoring on 8th Street in Sweetwater. Self-Propelled Modular Transporters (SMPTs) equipped with pull-up gantries were placed beneath the main span, lifting the structure from the temporary shoring, before it was carried in a roughly 90-degree arc and lowered into place, an FIU fact sheet said. According to FIU, this was “the largest pedestrian bridge move via a Self-Propelled Modular Transportation (SPMT) in U.S. history.” The move occurred on March 11. The section that was moved into place weighed 950 tons and spanned 174 ft. The bridge was designed to withstand a Category 5 hurricane. The bridge was the first worldwide to be built entirely with self-cleaning concrete, which uses titanium dioxide to capture pollutants and clean the surface, which reduces maintenance. The bridge cost $14.2 million to build and is part of a $19.4 million TIGER grant from the U.S. DOT. Key stakeholders include the FHWA, Florida DOT's Local Agency Program, FIU and the City of Sweetwater. Key companies involved in the project include: Barnhart Crane & Rigging, which provided and operated the SPMT; and Figg Bridge Engineers and Munilla Construction Management, who partnered together to design and build the structure. This is the first time a bridge that was built using accelerated techniques has collapsed. Details are still formulating about what exactly occurred to cause the bridge to collapse; the National Transportation Safety Board is planning to be on the scene the evening of March 16 to conduct an investigation by a team of 15 specialists, including experts in the engineering, material science and survival factor fields. According to team leader and NTSB Chairman Robert L. Sumwalt, if the agency finds any problems with ABC methods, it can issue a series of “urgent interim recommendations,” ENR Southeast reported. Sumwalt went on to say that as far as he knew, “there have been no problems” with other projects using ABC methods. Initial reports stated that two construction workers were working on the side of the bridge when it fell. Amjad Aref, a University of Buffalo professor in the department of civil, structural and environmental engineering, told USA Today that the bridge should have been stabilized with temporary supports until the connections between the permanent columns and foundation were finished. According to Heavy.com, MCM, though it has a “long history of successful projects that have had no issues,” was accused in a lawsuit on March 5 in Miami-Dade Civil Court of causing injury to TSA employee Jose Perez at the Fort Lauderdale-Hollywood International Airport. MCM was awarded a contract for the airport's expansion, and as part of the work, built a temporary bridge for airport employees to use so they could access the restrooms as construction was underway. But the bridge broke beneath Perez on Oct. 20, 2016, and he sustained broken bones and spine damage, Heavy.com reported. While Figg has been involved with the successful design and construction of a long list of bridges across the country, the company did receive citations when the Jordan Bridge span in Virginia collapsed while still under construction in 2012, Heavy.com reported. A 90-ton concrete piece of the bridge fell 40 ft. onto railroad tracks below as workers were installing it. Four workers sustained minor injuries, none of which required a hospital trip. have specific safety procedures in place for repair and maintenance jobs. The girder in question was used to support portions of the bridge as it was built across a river, but the piece, which was meant to be used for a straight bridge needed modifications to allow it to support the Jordan Bridge's curved design, Heavy.com reported. This is a developing story. Please check back for more details as they emerge.